The tunnels through the mountains from Milan to Sanremo are an amazing engineering achievement and worth every euro (and it costs a lot of them). They come up at intervals of every 2km on the road and consequently become really annoying. They are often with cars so windows must be closed at all times to avoid the exhaust fumes and even though it certainly seems like the shortest route, it always takes more than twice as long to get anywhere. But then it just makes yu enjoy your destination so much more, just to get out of the car. In 1670 a Roman Catholic priest, and travel writer named Richard Lassels wrote the book “Voyage to Italy” which started the “Grand Tour”, guided tours for upper-class Brits with academics through France, Switzerland and Spain. Those eager to hit the Italian classics passed go and went right to Italy, starting in Turin and working down the Ligurian coast towards Genoa and then going onto Pisa, Venice and Florence. By the early 1800’s, all aspects of a good European breeding was based on the classical studies; architecture, literature and love of nature. Romanticists like Keats, Shelley and Byron spent much of their lives in Italy, much of it along the coast of Liguria. In 1855, an Italian author named Giovanni Ruffini moved to England and wrote a novel called “Doctor Antonio, a tale of Italy” about an Englishman and his daughter who are swept away with the romantic beauty and people of Sanremo. In 1857, it did for Liguria what Peter Mayle’s “A Year in Provence” did for the south of France in the early 1990s or what Frances Mayes’ “Under the Tuscan Sun” did for Tuscany in the late 1990s. 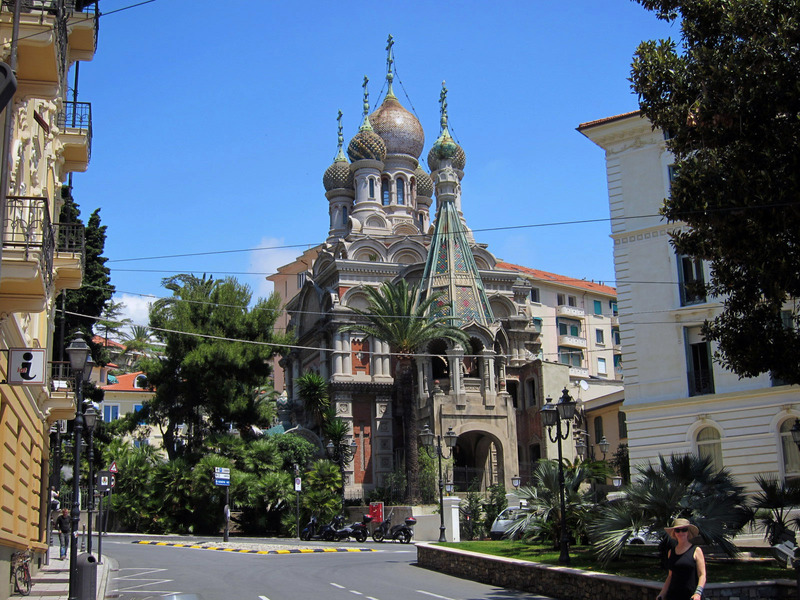 By the 1890s and into the early 20th century Grand Hotels began to pop up in Sanremo. It became one of the most fashionable places in Europe, home to Tchaikovsky, Kaiser Frederick Wilhelm, Empress Maria Alexandrovna, Alfred Noble, Empress Elisabeth (Sissi) of Austria, the nonsense poet Edward Lear and Italian author, Italo Calvino. Both Mehmed VI, the last sultan of the Ottoman Empire and Mohammed Ali Shah Qajar, Shah of Persia died here in 1926. Sanremo still holds onto that old world Riviera grandeur. It has a large Liberty Style casino built in 1905 and some pretty beautiful old hotels, but it’s all a bit faded. The casinos keep people coming and it’s a good stopover on the way to the Cinque Terre or Tuscany. However, the biggest draw of Sanremo these days is the Sanremo Music Festival that has launched the careers of singers since the 1950s. The song “nel Blu dipinto di blu”, known in the US as “Volare” premiered at the music festival in 1958 by Domenico Modugno, who left acting and singing to become a member of the Italian Parliament in 1986. He’s currently fighting for social issues against inhumanity but I’m sure he get up to a microphone now and then for a song. 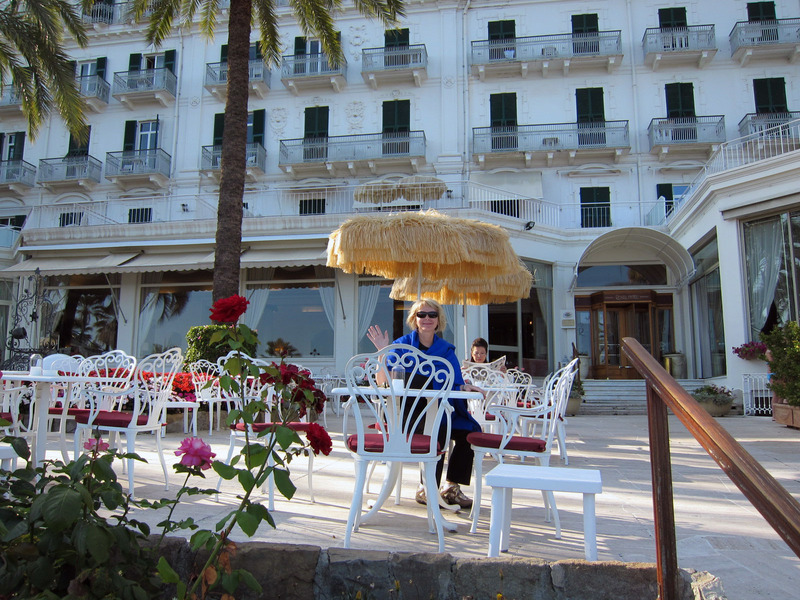 Our hotel, the Royal Hotel Sanremo, is one of the old Grand Dames along the Corso dell’Imperatrice, named for Empress Maria Alexandrovna, the grandmother of Czar Nicholas II who used to vacation here. The Russian church nearby was built for the royals in 1913. The church is used by the local Russians, Ukrainians and Moldavians. The big fun for us was not along the grand boulevards. 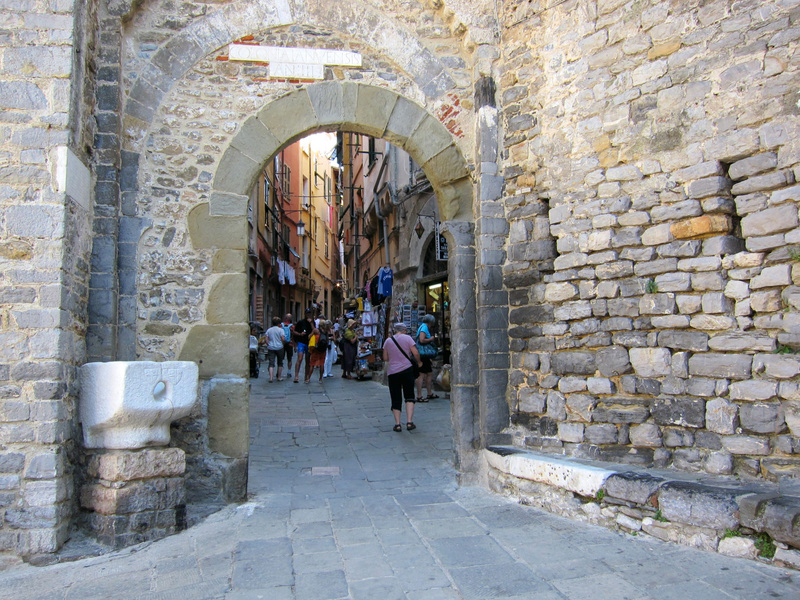 We liked the winding streets and tunnels of the old town known as “La Pigna”. This area was built around 1000AD and was surrounded by fortifications to fight off the Saracens up to the 16th century. The “Pigna” is alive with small cafe’s, restaurants, churches, small alleys, tall hills and designer shop that cater to the tourist trade. Even with the tourist business, it’s still a wonderful walk back in time. On our second day here, we hopped back into the car and drove the rural SS1 from Sanremo to Albenga thinking it was close to the way the Romans traveled along the Via Julia Augusta. I think the road was much different back then. In fact it was probably in a completely different location. I know the Romans accomplished a lot with their road engineering but I don’t think they had the capability to dig tunnels through mountains. Anyway, it was about 75 minutes to get to Albenga on the coast road and about 20 minutes to get back on the amazing A10 Autostrada, or 40 km and 40 tunnels. The octagonal baptistery in the center of the old town is supposedly from the time of Constantine (4th century) but it’s been rebuilt many times since then. We’ve driven by this city a number of times but never had the desire (or courage) to stop in. It always looked so unappealing and unsightly, but then we’ve learned (so often) that once get through a few layers of grime and ugly post war renovation there is a beautiful jewel of a city inside. It’s a web of tunnels and elevated highways to get down to the city and, of course, a driving adventure to get back out. Genoa is renowned for the best focaccia, the best pesto from Genovese Basil, legendary salami and olive oil and a history going back to the Crusades. 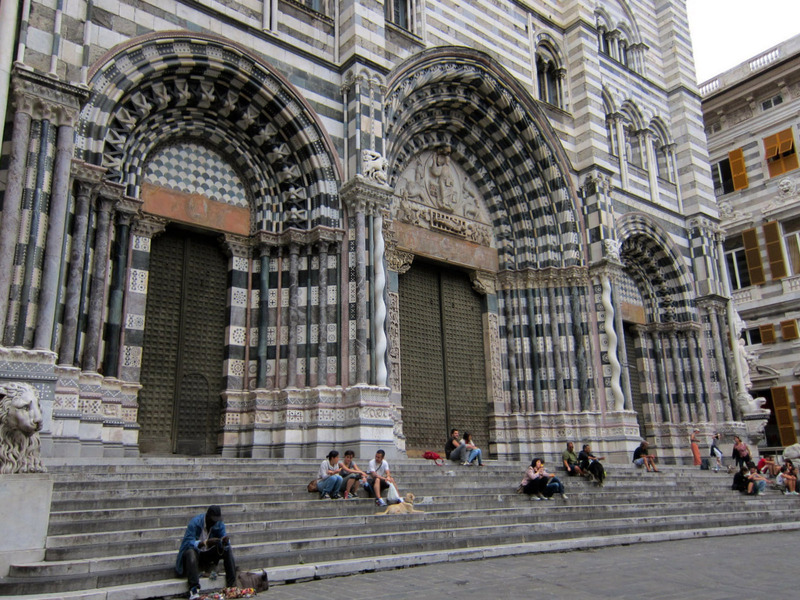 By the time of the 1st crusade in 1097, Genoa had become a main embarkation port to the Holy land and the money started to roll in. By the 15th century the city was controlling all fleets and imports of the Spanish exploration to the Americas. It became the wealthiest city in the world in the late 16th and 17th centuries and the bankers, who basically ruled the city, built dazzling palaces along the Via d’Oro (the street of gold) in a new part of town. These days, the giant palaces are occupied by banks instead of bankers, and today the Via d’Oro is called Via Garibaldi named for Giuseppe Garibaldi, the general of the Italian unification. Oh, one last note on the shipping history of Genoa. Amongst some of the exports was a strong blue cotton material shipped to America that was nicknamed “de Genes” (from Genoa). Yes, jeans came to us from Genoa. 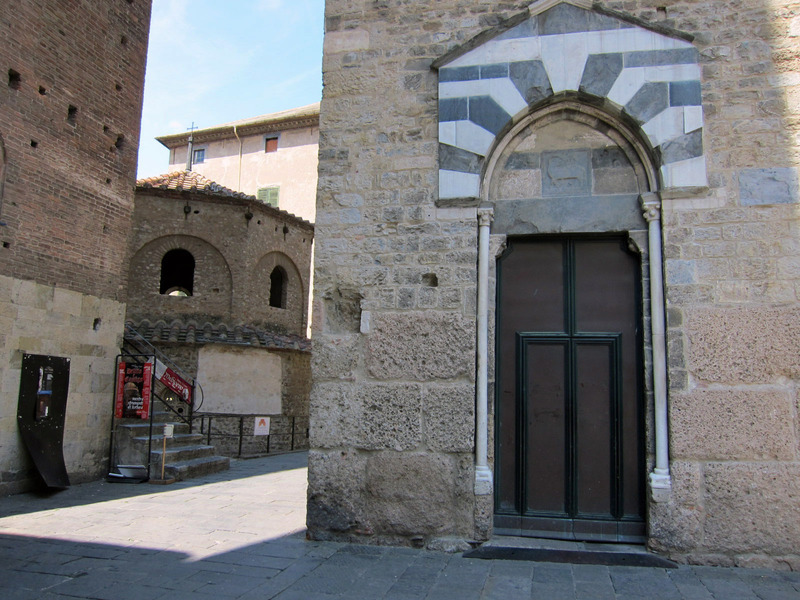 The entrance to the old town is through the large stone gate called the Porta Soprana (photo above), built in 1155 as part of the 12th century Barbarossa walls built to keep out Frederick I Barbarossa, the German Holy Roman Emperor, not to be confused with Hayreddin Barbarossa, the Turkish admiral who defeated the Genovese Admiral and Doge, Andrea Doria. The old medieval quarter is a confusion of small alleys and tall tenement houses ornamented with colored laundry hanging out the dry. Christopher Columbus was born in Genoa. In fact there is a house, supposedly where he was born just outside the old city walls. Columbus made 4 trips to the new world. He landed in the Bahamas, Cuba, the Dominican Republic, Puerto Rico, the Lesser Antilles, Trinidad, Venezuela, Honduras and a few other parts of Central America. However, other than Puerto Rico, Columbus never set foot in America. It was another Italian named Giovanni Caboto, also from Genoa, who sailed to North America in 1497. He was known to the British who sponsored him as John Cabot. Why we celebrate Columbus Day instead of Cabotti Day is anyone’s guess. Much of the medieval center has been restored, most of it in 1992 for the 500th year commemoration of the discovery of the New World by Columbus. It was pretty bombed out from British fleet during World War II, but now the only remains of the war is an unexploded shell in the city Duomo, the Cathedral of San Lorenzo. The cathedral was closed for us but the shell is still inside and still loaded. The Duomo is also home to some other interesting treasures including: The Holy Grail (yes, the Holy Grail), the blue chalcedony quartz dish that held the head of John the Baptist and a 15th century casket purportedly holding the ashes of John the Baptist. It’s odd that with all the John the Baptist treasures, the Duomo is dedicated to San Lorenzo. We’ve seen another “holy grail” in Valencia, Spain. I’m sure there are a couple more of them floating around as well. Today, Genoa is still Italy’s largest port. The old port, Porto Antico, was redesigned by Renzo Piano, also a Genoan, for the 1992 commemoration of Columbus. The highlights of the port is the giant aquarium built to look like a giant container ship, but there are a few other attractions like Il Bigo, a multi-arm crane that lifts up a small gondola for a better view of the city and La Bolla, a glass bubble with a glass bottom to see under the sea. One looks up, the other looks down. 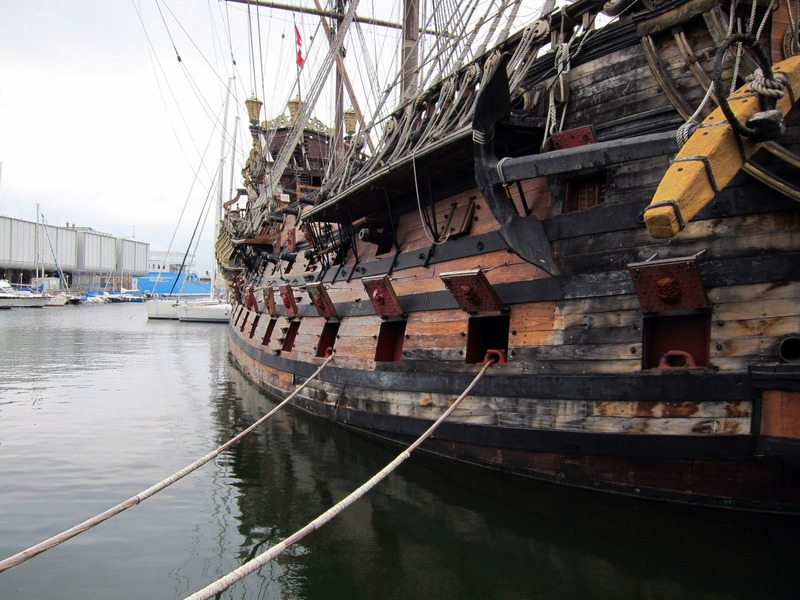 They even got a hold of the “Golden Neptune”, the pirate ship built for Roman Polanski’s 1986 film “Pirates”. There she sits in the harbor, a call back to the good old 16th century days of Genoa. Genova is 30 minutes (and 30 tunnels) to Sestri Levante, a beautiful promontory that separates the Bay of Silence from the Bay of Fables, named after Hans Christian Anderson who lived here in in the mid 1800’s. We’ve run into him a lot in the past few years. 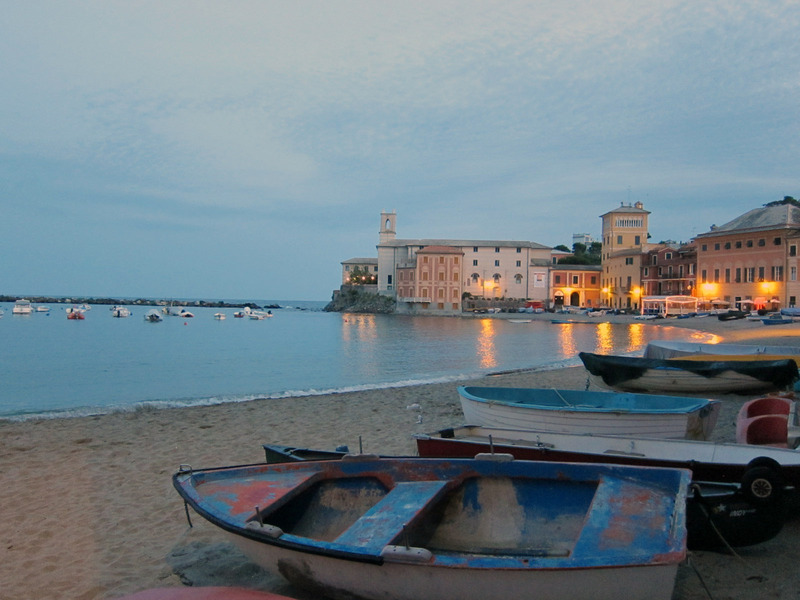 While most of the international tourism is tilted towards Portofino, Sestri has remained a favorite of the Italians. We only ran into 2 other English-speaking people the entire time we were there. Our first Hotel, the Vis a Vis, was up on a hill with a spectacular view over the Bay of Silence. The hotel staff made a point to show it to us from the 5th floor terrace before he showed us our deluxe accommodations. The hotel room was about the size of a sleeping room on a cabin cruiser. We could turn around in the bathroom but we couldn’t really walk into it. Instead, we walked out and checked into the Hotel Miramare with an amazing view of the bay. Sestri was a lot of fun. 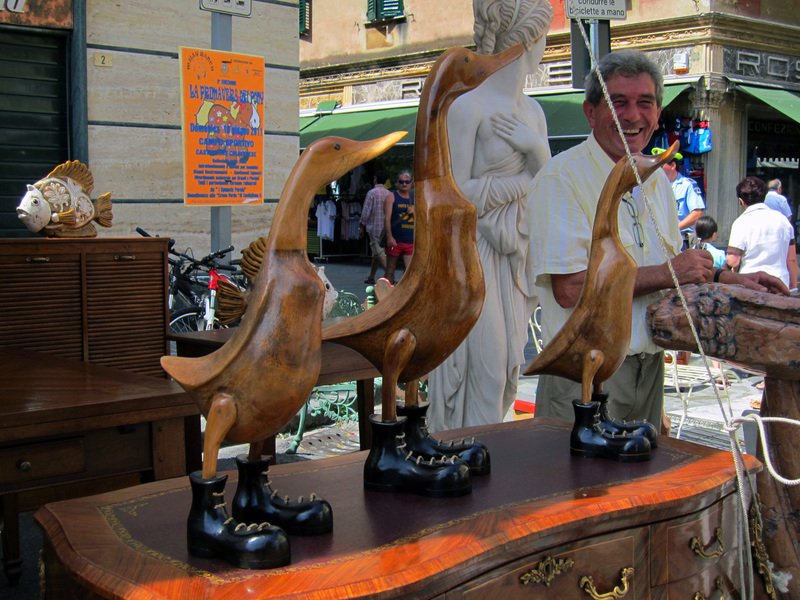 We strolled through the Saturday food and clothing market and the Sunday antique market. There was a local festival on the beach, including the classic sounds of a local band named Magnolitalia, featuring Franca Leuca (sp}. We ate local pulpo, pesto and pastries, and we saw no less than 4 weddings. One of them literally surrounded us as we were having a glass of wine at the Millelire bar on the main pedestrian street of the old quarter. It was 30 minutes of snarky dresses, ostentatious tattoos, silicon implants and platform shoes. The men wore shiny suits with flipflops. It was all a lot of fun. 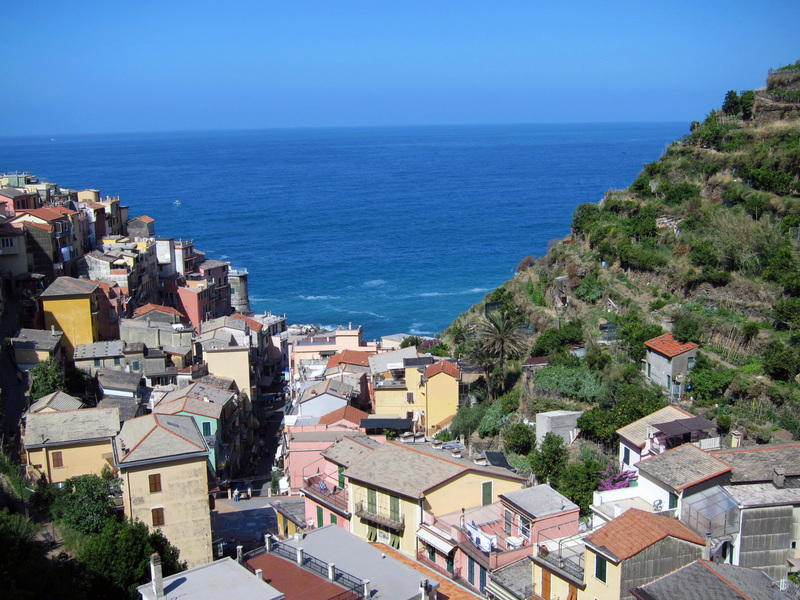 The train from Sestri Levante to Manarola, in the Cinque Terre is probably about 25-30 minutes. By car it was about an hour and a half through tunnels and switchbacks, but somehow we made it without getting lost even once. We thought about leaving the car in Sestri and picking it up after our visit to the Cinque Terre, but there was a parking lot about a 10 minute walk down to our hotel in Manarola. 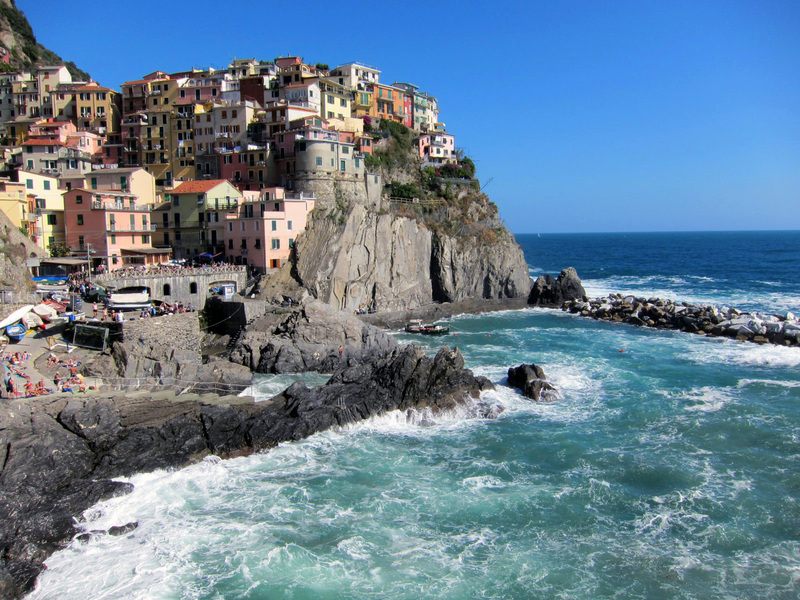 It’s impossible to drive to any of the five towns of the Cinque Terre. One more reason we loved our hotel La Torretta. 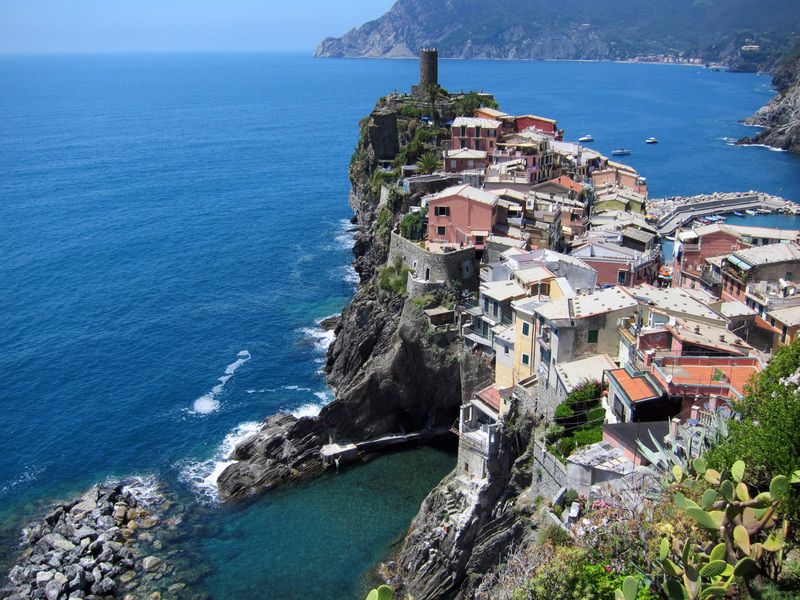 The name (Cinque Terre; five lands) refers to the five villages of Monterosso al Mare, Vernazza, Corniglia. Manarola and Riomaggiore. Our very small hotel (maybe 8 rooms) La Torretta is in Manarola. It’s either a steep walk down from the parking lot or a steep walk up from the train station, but then everywhere in the Cinque Terre is a steep walk. We have a beautiful private terrace with a postcard view overlooking the Mediterranean to one side and one of the most vertical wine vineyards in the world on the other. They take their winemaking serious up here. The more than 7,000 kilometers of stone terraces have been maintained since the middle ages, when they were literally dug by hand, some of them dug were even dug earlier by the ancient Romans. The grapes are harvested by hand and carried by donkeys or into the Trenino del vino, a small railway that travels along cogs built along some of the terraces. Italy gets over 43 million tourists a year and is currently the 5th most visited country in the World. I think most of the English-speaking tourists come to the Cinque Terre. There are probably les than 4000 people inhabiting these 5 towns from December to March, but between April and November, tens of thousands of mostly Americans, Australians, New Zealanders and Brits invade the slopes. They’re yakking it up along the hiking trails, crowding the sandy beaches of Monterosso al Mare and Vernazza, piling into the trains and boats and filling up all of the restaurants and shops. Everyone speaks English. We speak Italian to the locals, they speak English to us. The villages are connected by train or battelli (boats) that sail on calm days. There is also a footpath called the Sentiero Azzurro (Blue trail). 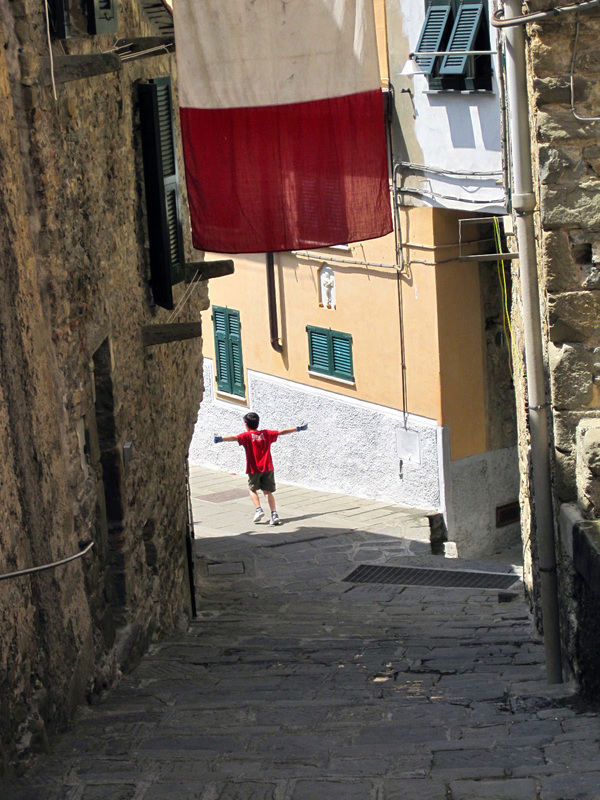 The Via dell’Amore stretch from Manarola to Riamaggiore is the widest and easiest walk, about 20 minutes. It even has wheelchair access. The other trails are longer and more difficult. 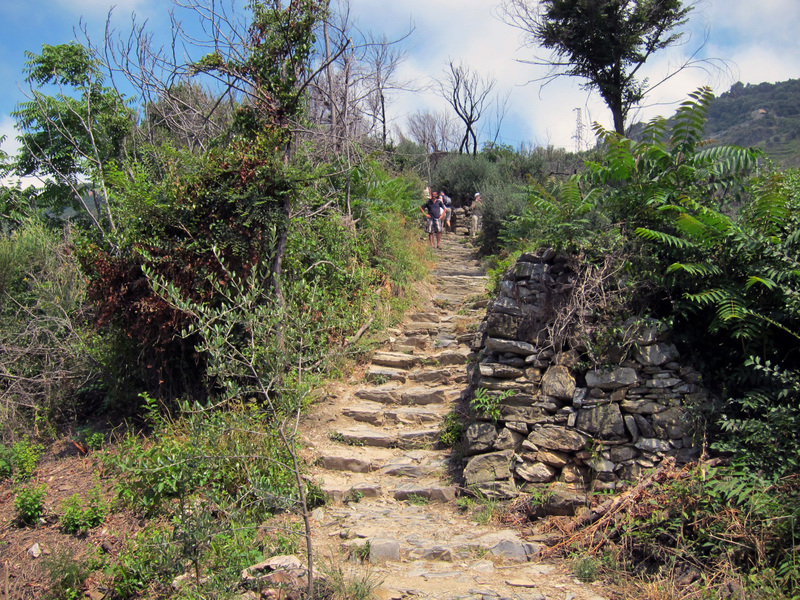 The trail from Manarola to Corniglia is supposed to be an easy hike but it was closed because of a landslide so we opted for the medium level hike from Corniglio to Vernazza. We’ve been seeing a good number of hikers with their big, expensive hiking shoes getting on and off the train. I had no idea that the trails required proper hiking footwear. They were right, I was wrong. 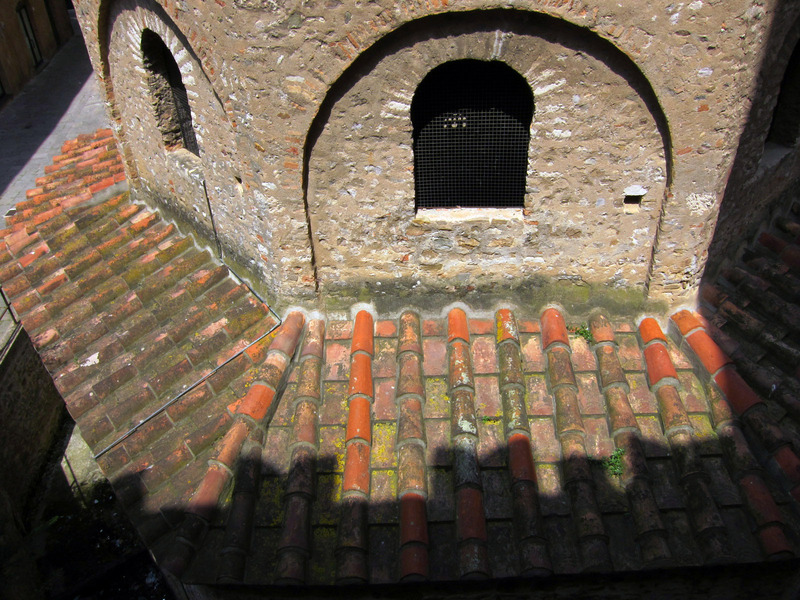 My sandals made it up and down the polished, slick stone steps but it was a slow pace. Gretchen was smarter than me and brought more sensible shoes. Getting off the train in Corniglio, we first had to climb the 368 steps up to the town and then up again into the steep incline of the town streets just to get to the hiking path. It was the cardio warm up for the trail. Then after a 90 minute up and down hike over the mountain path we arrived to Vernazza. What a beautiful view it was. And after a cool refreshing granita and gelato, we walked over to the port and took the 70 minute battelli (boat) cruise to Portovenere, the Port of Venus, named for the temple of Venus built here during Roman times. The temple was replaced by the 12th century church of Peter the Apostle, which is still there and still in use. 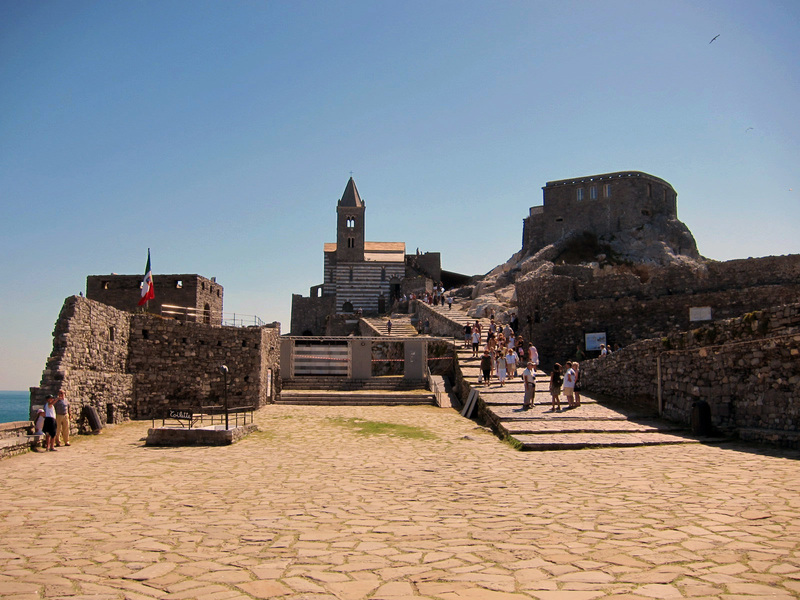 Portovenere sits on the promontory close to La Spezia and has been designated a UNESCO World Heritage site since 1997. 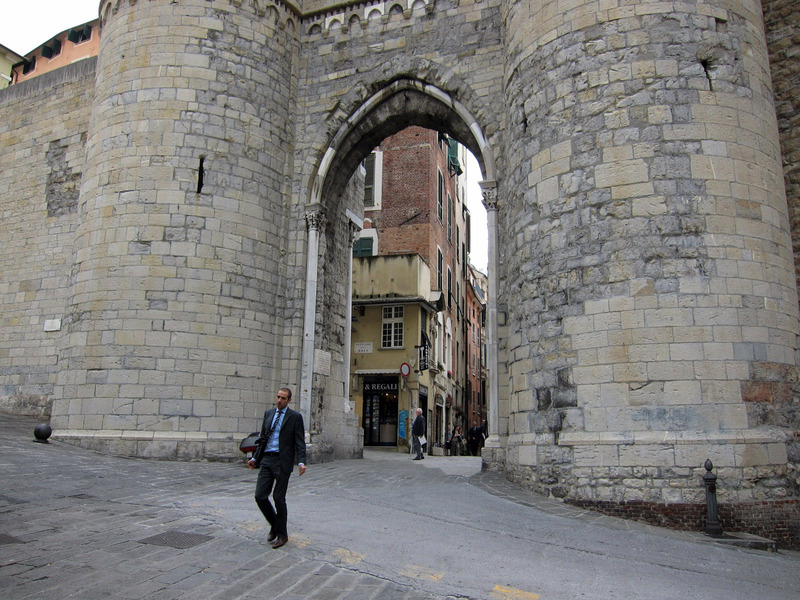 From the harbor, the old town opens up through a 12th century tower gate built by the Genovese. This was one of the Genovese strongholds in the 12th century war with Pisa who held the village of Lerici across the bay. Directly below the church of Peter the Apostle is the Grotta dell’Arpaia, also known as Byron’s Grotto. It’s a bit collapsed these days but in the 19th century it was Lord Byron’s favorite swimming spot. In 1822, When Lord Byron heard the news of Percy Bysshe Shelley’s death in a boating accident, he swam across the bay to San Terenzo. The bay has since been named the Bay of Poets. We’ve been enjoying all the local edibles from pulpo (octopus), badi badi (a local langustino); DOC protected marinated anchovies from Monterosso, Ligurian/Genovese pesto, focaccia, farinata (a chic pea thin bread baked like a pizza) and the wines. The local vernaccia grape makes some of the best white wines in the Italy, and although we always go for the reds, we did have a taste of the sweet 17% alcohol dessert wine called “Sciachetrà”. The local translation is raisin wine because the grapes are sun dried before they are pressed. Actually the process is very similar to the Vin Santo of Tuscany. In fact, the wine tastes very much like Vin Santo. 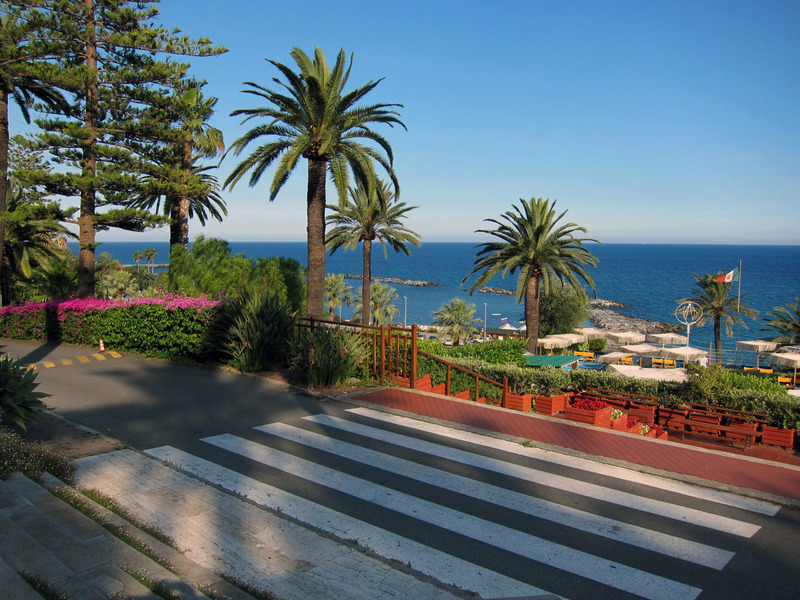 Our hotel, La Toretta, is a very short walk from one of the local favorite restaurants, “Trattoria dal Billy”. This place gets very high marks on many travel sites, including Tripadvisor. The food is good (and pricey) and the service is pretty bad. We ran into the same problem at “Trattoria Locanda Il Porticciolo” closer to the harbor. In fact the service at most restaurants of the Cinque Terre is rude, slow and pretty bad. It’s one of those love/hate kind of jobs. They love the income, hate the work. The onslaught of tourism must really get to them. I’m glad we weren’t there in August. The attitudes probably get worse as the summer rolls on. I can’t really blame the wait staff. The customers are also really bad. “Where is my bread? I ordered my drinks 30 minutes ago. Where is my food? How come I can’t get the check? We hear the same complaints everywhere we go. The restaurants are understaffed and the customers are too impatient. Everyone needs to just chill out. We’re all on holiday.